Here’s a small app which allows you to rotate your desktop wallpapers from a Flickr account. 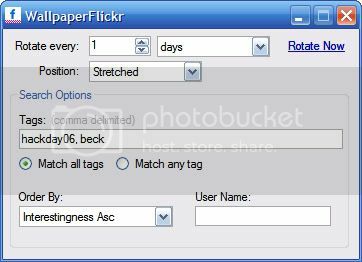 You can specify tags or a Flickr username which the program will use to download wallpapers to your computer. The program is pretty small in size (just 51kb). To rotate Flickr wallpapers on your desktop all you need to do is just download Flickr Wallpaper Rotator and run it, add tags or a flickr username, it will be minimized to your system tray. Sit back and enjoy the wallpapers change. A separate wallpaper directory is created which saves all the downloaded wallpapers and uses them. You will also find a text file with the name wallpapers.db which keeps track of the wallpapers you’ve downloaded so that an image isn’t shown more than once. If you want to clear history then open the file in a notepad and delete the text.